Is it just me or is room spray an unappreciated commodity? Do we take it for granted? Not utilizing all of its qualities? I feel room sprays tend to sit, sad and unloved, on shelves to collect dust or hidden away in cabinets like a taboo bathroom product. No more, I say! No more. Room sprays have beautiful features such as providing instant, safe and effective fragrance. Like a burst of sunshine, a room mist can change a room from doom to gloom faster than you can unlike a song on Pandora. To make sure that you are getting the most of your home fragrance mist, I asked our fragrance experts (yes, you, Candles Off Main Facebook Fans) to give us your most creative way to use a spray. Your ideas are revolutionary! I like to spray my pillows during the daytime, so when bedtime arrives there is just a hint of fragrance when you lay your head down. - Caitlin C.
I like to spray room spray into my vacuum filter and every time I give my carpet a cleaning it fills the room with the scent. Quick and refreshed carpet without having to buy that nasty carpet powder. 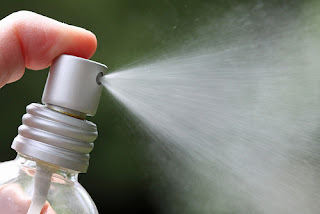 - Ryan K.
I often spray room freshener on curtains; some fragrances/brands last a good while and you catch a whiff of the scent when there's a breeze. - Joan G.
I like to spray the inside of a trash can before I put a new trash bag in. It smells nice every time you throw something away. - Dave A.
I like to spray inside my dresser drawers & in my closet! -Angela D.
Sometimes I spray my favorite fragrance on towels I store for longer periods of time. - Diego B.
I spray the inside of my suitcase before I pack. It keeps my clothes from smelling stuffy when I arrive at my new destination. - John B.
I like to spray the cloth lining inside my laundry basket to keep things smelling fresh until laundry day. - Jenna V.
I like to spray the carpets in our car before we leave on a road trip. Makes for a lovely drive! - Sue A. Always test a room spray on fabric in a subtle spot in case there is a reaction. Thymes home fragrance mist is and aerosol and works well on fabrics. Room sprays by Votivo and Trapp are in decorative bottles that are good looking enough to be left out where you'll be more likely to use it. 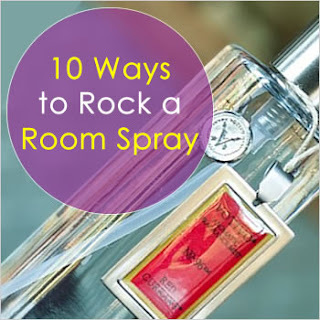 The room sprays by Voluspa are cosmetic grade, so if you really love it, go ahead and spray yourself as well! Some people only use the Voluspa sprays as a body spray. Suede Blanc and Apricot & Aprilia can be worn beautifully. So go ahead! Break out your spray. Get crazy and creative with it and then share your most creative uses by commenting below. Spray away I say! Nice pic by the way :) room spray is a good scent.